There is an old joke about the BBC only having 12 actors, 10 props and 6 sets. That’s not entirely true, of course, but it is true that many actors appear in multiple BBC productions. It goes on behind the scenes as well, with screenwriters, directors and showrunners. Two of the biggest shows from the BBC right now currently share a showrunner in Steven Moffat. Sherlock, starring the red hot Benedict Cumberbatch and Martin Freeman, and Doctor Who, which is about to air it’s last season with Moffat in charge and Peter Capaldi in the lead role. The two shows also share Mark Gatiss, who writes and has acted in both, and co-runs Sherlock. 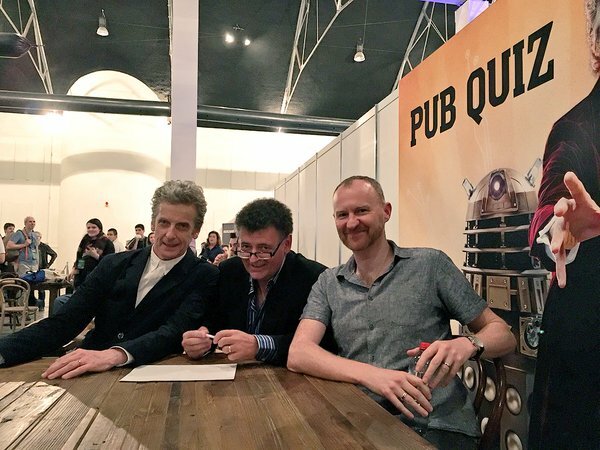 Peter Capaldi, Steven Moffat and Mark Gatiss at a Doctor Who pub quiz. They came in third. Sherlock is a modern day retelling of Sherlock Holmes. Doctor Who is family-friendly time-traveling science fiction show. Aside from the BBC and modern-day London they would seem to have little in common. But fans of Doctor Who and its spinoff Torchwood were treated to a blink-and-you-miss-it easter egg in the latest series of Sherlock, with a card bearing the logo of Torchwood among the mail on the mantle. There are other potential combinations. After all, the Tardis from Doctor Who can go anywhere in time and space. Many actors have appeared in multiple shows. Russell Tovey has played a Midshipman in Doctor Who, a man haunted by memories of a hound in Sherlock and a werewolf in Being Human. What do you think of the crossover potential? What other BBC shows might be combined? Leave a comment and tell us what you think!